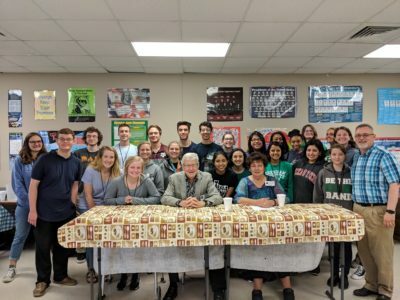 Last week, Brenham High School students hosted a debate for the contested Brenham mayoral election. Mayor Milton Tate (center) and mayoral candidate Dorothy Morgan (to right of Tate), along with members of Jason Barber's AP Government class. Students in Jason Barber’s AP Government class put on the debate for incumbent Milton Tate and challenger Dorothy Morgan. Students asked questions regarding the candidate’s priorities, current challenges in the community, and opportunities for growth and improvement. Candidates spoke about strengthening the local economy by bringing in new businesses, addressing the issue of affordable housing, and encouraging a younger generation of citizens to get involved in planning for Brenham’s future. Barber said the candidates’ visit fit perfectly with AP Government’s current study topic of political campaigns. He said “it was great to see an honest discussion of local political issues”.